By this point, the fact that Russia used social media platforms to influence Americans during the 2016 election is common knowledge, but it’s taken over a year to learn the shocking truth about just how deep the Russian infiltration of our online lives has gone: A recent Senate investigation has discovered that Facebook received $90 million from the Russian Kremlin to post a picture of Tweety Bird reciting a “10 Rules For Dating My Daughter” list during the election. This discovery has all the makings of a major scandal. It’s absolutely chilling that a foreign government had this much control over our social media. 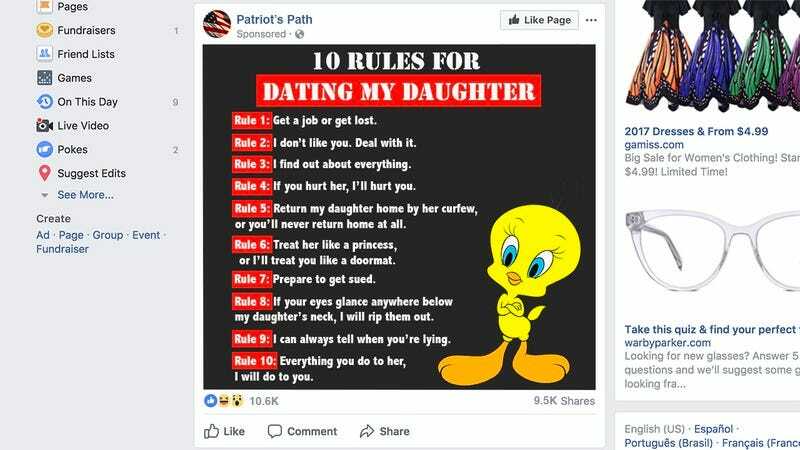 While it’s troubling enough that the Russian government was able to use Facebook to disseminate this image of Tweety Bird crossing his arms while saying, “Rule 6: Treat my daughter like a princess or I’ll treat you like a doormat,” the sheer reach that this image had during the general election between Hillary Clinton and Donald Trump is absolutely bone-chilling. Facebook executives reported that with the $90 million they received from the Kremlin to promote the image on their users’ news feeds, they were able to ensure that more than 250 million Americans read the complete “10 Rules For Dating My Daughter” list in the weeks leading up to the election. This alarming number includes a massive Election Day push, meaning that this Kremlin-sponsored image may have been the last thing many voters saw before casing their ballots. By the time the polls closed on November 8, it’s estimated that more than 12,000 Facebook users had posted laughing face emoji on the Kremlin’s Tweety Bird meme, and that more than 20,000 people had posted comments beneath the image either tagging their friends or voicing their enthusiastic agreement with the items included in the “10 Rules For Dating My Daughter” list. It’s completely disgraceful that Facebook allowed the Russian government to distribute a Looney Toons meme so widely during an election. These disturbing revelations need to serve as a wake-up call to the social media titan that it has to be more vigilant about what content it allows to appear on its users’ feeds. The security of our nation depends on it.